A Tradition of Excellence is not merely the school motto; it is a testament to a commitment that St. Michael School made to its students over 140 years ago. We continually strive to ensure that each of our students receives a challenging and rigorous curriculum, and our students have proven that they have gained the knowledge and skills to be successful as they continue in their academic careers. St. Michael School participates annually in the Iowa Test of Basic Skills, the standardized testing administered in the Diocese of Norwich. This past spring, as in previous years, the results were quite good. The middle school test results show that all of our middle school students are performing at least two grades above their grade level. This means that the sixth grade students performed as well as an eighth grader would have performed taking the same test. Our middle school sent four science fair projects to the state science fair last spring and, as in previous years, our students made the finals and received special awards and honors. Our Robotics Team again received a golden ticket to the state tournament, winning the most points at the robot table and the award for best technical design at the qualifying meet; and a Judges Award for all-around performance at the state tournament. 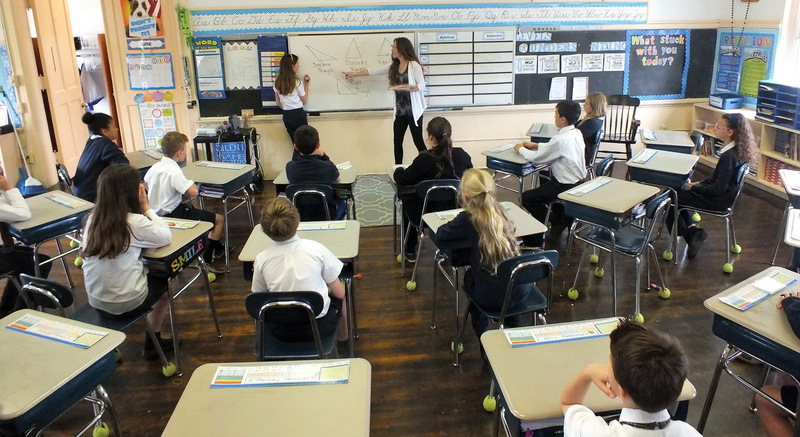 St. Michael School serves children grades K-8 and is fully accredited by the New England Association of Schools and Colleges and the State of Connecticut.